Bringing in the judiciary has now resulted in its total politicisation. Last Sunday, some judges squabbled in public while the federal police refused to honour their orders. Some governors released a statement that contested the denial of habeas corpus to Mr. Lula, while a group of lawyers released a statement saying that the judiciary had become corrupted. Brazil’s National Justice Council has opened an investigation of the chaos but it is unlikely that its report will solve the rot that has now entered the judicial establishment. Neuri Rossetto, the coordinator of Brazil’s Movement of the Landless Workers’ Movement, has said that this crisis of state institutions will have serious repercussions for the legitimacy of Brazil’s institutions. Professor Pomar says that it is likely that the courts will deny Mr. Lula’s right to be on the ballot. This does not offer a clear advantage to the right wing. Divisions within the ‘camp of the coup’, as the right wing is called these days in Brazil, and their disregard for Mr. Bolsonaro suggests other possibilities. Mr. Lula might anoint the president of the PT, Gleisi Hoffmann, to run in his place or there might be a call to boycott the election. The crisis, according to Professor Pomar, will be prolonged till the weeks before the October vote. What is clear is that Mr. Lula, or at least the myth of Mr. Lula, dominates discussion in Brazil. 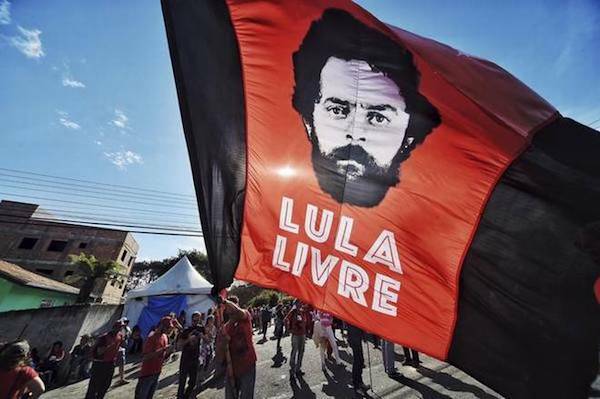 It is not the PT that commands the allegiance of the millions who are now members of the party and the many millions more who would vote for Mr. Lula. It is clear that it is Mr. Lula to whom they turn. Meanwhile, Mr. Lula has been prevented from seeing reporters but is allowed to use his Twitter account and see visitors. From his cell, he wrote this week that he feels “indignation at the suffering of the poor Brazilians”. The hashtag for these tweets is straightforward: Lula’s Message (RecadoDoLula). Another hashtag that is doing the rounds is Mozão—I love you. It refers to Mr. Lula.